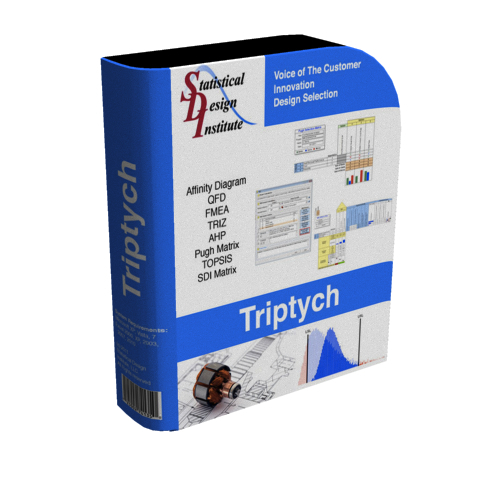 Triptych is the informational engine of SDI Tools that defines the opportunity for product development by translating abstract customer requirements to concrete design requirements . Triptych processes information that is entered in easy-to-use, interactive Excel worksheets and the results become a key part of the product development process. Prioritizes (or ranks) Items by performing pair-wise comparisons of Items against each other in terms of relative importance. Captures the voice of the customer and translates it into engineering requirements using Quality Functional Deployment methods. Document and prioritize (or rank) Requirements by performing pair-wise comparisons of Requirements against each other in terms of relative importance. A Tool for sorting large number of ideas or concepts into logical groupings. Generates ideas for solving technical contradictions. Qualitative multi-criteria decision making preliminary designs. Goal-based multi-criteria decision making for preliminary detailed designs. Quantitative multi-criteria decision making for detailed designs. Define Design Items, External Systems, and the type of interfaces that exist between them. Start with information from the Requirements and Boundary Diagram, and define potential influences and relationships to performance. A risk assessment technique for systematically identifying potential failures in a system or a process. 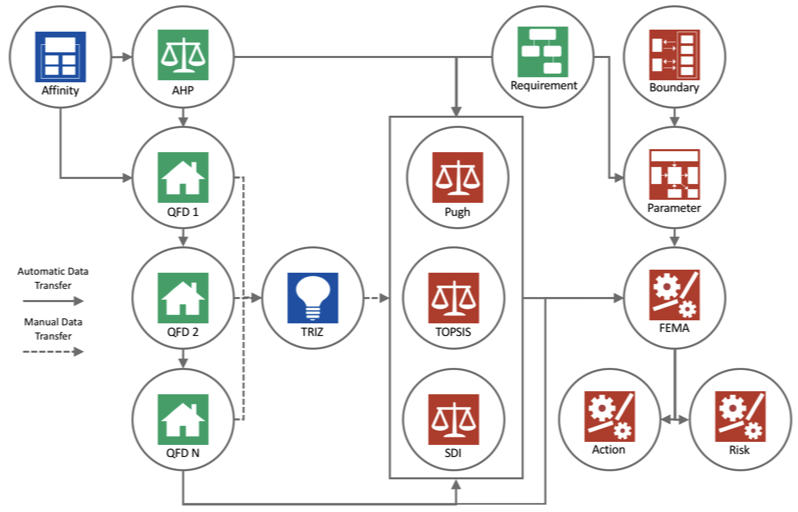 Use the Parameter Diagram information to initiate the FMEA risk assessment technique for systematically identifying potential failures in a system or a process. Capture selected information from the FMEA to create a record of Potential Failure Modes and Effects. Create a customized version of the FMEA for risk tracking and management. Unlike our competitors, Triptych worksheets are not static Excel templates. They are intelligent, interactive worksheets that automate the flow of information from worksheet to another to support the product development process. The diagram below shows how information can flow among the Triptych worksheets.